I graduated from the Lviv National Medical University, completing my studies in 2012. My postgraduate internship was in a prestigious clinic in Warsaw, where I also actively volunteered for the Foundation of Julia the Squirrel. 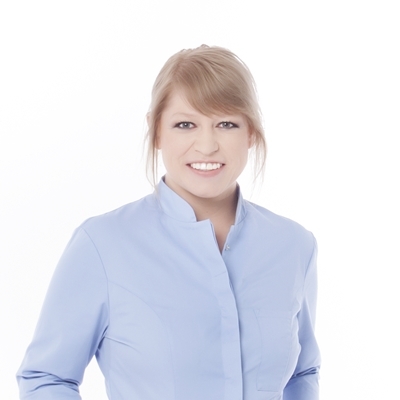 As a dental practitioner, I constantly strive for perfection and improve my knowledge and skills by participating in numerous training sessions and courses in dentistry. My interests revolve around paedodontics and conservative dentistry with endodontics. However, it is the former that has become my greatest passion. The youngest of our patients enjoy working with me and are willing to return to their subsequent appointments without any fear. Apart from being empathetic, delicate, patient and understanding, I am also accurate, which is equally important. 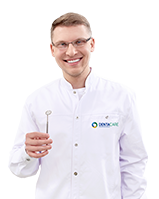 As a dentist, I am not only eager to share my knowledge, but I also do my best to explain even the most complicated of cases in a clear and easy way. I specialise in stress-free and painless treatment using laughing gas, which makes it possible for me to handle patients with dental phobia. Endodontics for everyone...effective endodontics under a magnifying glass.